Now is this the kind of life we really want to lead? Is this really the path of human flourishing? Or are we called to something better, something greater, something more lovely? So let us put our trust in the God who loves us and who saves us, let us know our need of him and his transforming grace to fill our lives and transform all of his creation so that the world may believe and be transformed to sing the praise of God the Father, God the Son, and God the Holy Spirit, to whom be ascribed as is most right and just all might, majesty, glory, dominion, and power, now and forever. The Scouting Movement has as its motto ‘Be Prepared’ which rather sums up the message of this morning’s Gospel. As people who live in the countryside we are more than used to having a supply of candles and batteries ready at hand to deal with the inevitable winter power cuts caused by bad weather. It makes sense, so that we are not caught out – having to endure the cold and dark. The Gospel speaks of a more serious preparedness, one which we must all face. Our earthly lives are finite, and we have to be prepared for our end. We know that as Our Lord came among us born as a baby in Bethlehem, so he will come as Our Judge, and we have to be ready to meet Him. Rather than face this future with a feeling of uncertainty, of dread, we can as Christians have hope, we can watch and wait in hope, in the darkness, in the knowledge that Christ loves us, that he gave himself for us, he died to take away our sins, and that we can live for and through Him. It need not catch us unawares, as we have been warned, so that we can be prepared, we can be ready, with the lamp of faith and good works ready, trimmed and burning – a light burning in the darkness. It is a very human fear, and clearly the Christians in Thessaly around ad55 were more than a little concerned about what might happen. They can have the hope that ‘so we will be with the Lord forever.’ (1Thes 4:17) and therefore confident in that hope, they can begin to live out their faith here and now. They can live out the justice and righteousness which is pleasing to God, as it is how he wants us to live, so that we can have life in its fullness in Him. If what we believe in our hearts and how we live our lives are in perfect sync with each other, then we need have no fear, as the promise of sharing in Christ’s Resurrection is there for us – we do not need to be afraid, and we can get on with the business of living our lives secure in our faith. When we do this we can begin to see something of the just and gentle rule of Christ, as we will transform the world, and will be truly alive, living the life of heaven here in earth. Each day, as Christians, we pray, and we say the prayer that Jesus taught us which includes the petition ‘Thy kingdom come, Thy will be done on earth as it is in heaven’. So that our words are not empty, as well as praying for the coming of God’s kingdom, we have to do something about it – we have to show how prepared we are by listening to God and doing what he tells us. We pray, we are nourished by the word of God, in reading the Bible, we are nourished by the sacraments of the Church, by the Body and Blood of Christ in the Eucharist, so that we may be strengthened in our faith, strengthened to live it out in our lives, living out the sacrifice so that we may be drawn into its mystery, carrying our own Cross, and being conformed ever more and more to the example of Our Lord and Saviour, living in Him, living like Him, living the life of the Kingdom here and now, so Christ’s kingdom may come here on earth, that His will may be done. In the Gospels Jesus crosses swords with religious authorities on a number of occasions – it’s quite understandable – all they want to do is nit-pick. They want to accuse him of blasphemy, and are so fixated with what they think he may be doing wrong that they completely fail to see what he is doing right. It’s a sad state of affairs, but a very human one – we can all be judgemental, and it can blind us to what’s really going on. The Pharisees and Elders are so concerned with detail that they cannot see the wood for the trees – they fail to recognise who Jesus is and what he does. They are troubled by John the Baptist, with his message of repentance, of turning away from sin, and turning to God and having new life in Him, through the waters of baptism. Jesus can beat them at their own game and asks them a question which they cannot or will not answer. The central part of Jesus’ teaching is the Parable of the Two Sons: one says he will and doesn’t, and the other says he won’t and does. Actions then speak louder than words, and our faith as Christians is something which needs to be put into action in our lives – we have to walk the walk, rather than simply talking the talk –it is difficult, it is challenging but equally that is the point of our faith as Christians – as people who follow Jesus and who do what he tells us. Unlike the religious leaders, the message proclaimed first by John the Baptist and then by Our Lord is listened to and accepted by prostitutes and tax-collectors. These people were the lowest of the low – shunned by polite society for what they did, with a reputation for being greedy and sexually immoral, and yet they despite their failings know their need of God, they have the humility to recognise their need for grace and love to be poured into their hearts, and are willing to turn their lives around. They are not stubborn, hard-hearted or proud, they are humble – the kind of people in whose lives God can be at work. The message of repentance was proclaimed by the prophets, as we see in the first reading from the prophet Ezekiel. He calls the people of Israel to repentance, to turn away from their sins and be close to God, it is the same message proclaimed by John the Baptist, it is a message which finds its fulfilment in the person, teaching, and life death and resurrection of Jesus Christ. This is the hope for which the prophets long and to which they point. God wants us to live, to have life and have it in all its fullness by being close to him, humble, repentant, and fashioning our lives after the example of His only Son. It is the same message which the Apostle Paul preaches to the Church in Philippi – the obedience of the Son to the will of the Father, and at the heart of it all, the Cross. The greatest demonstration of God’s love for humanity, the power of God’s reconciling love at work to redeem, to heal and transform humanity. It is truly amazing that God loves us this much and that Christ flings wide His arms on the Cross to embrace the world with God’s love. We celebrate it because it is the single most important moment of human history, which can affect all time and all people. Here is the healing for which we long, the reconciliation, the restoration of humanity, and our relationship with each other and the divine. That is why on the night before he died Jesus takes bread and wine to point to what he is about to accomplish. 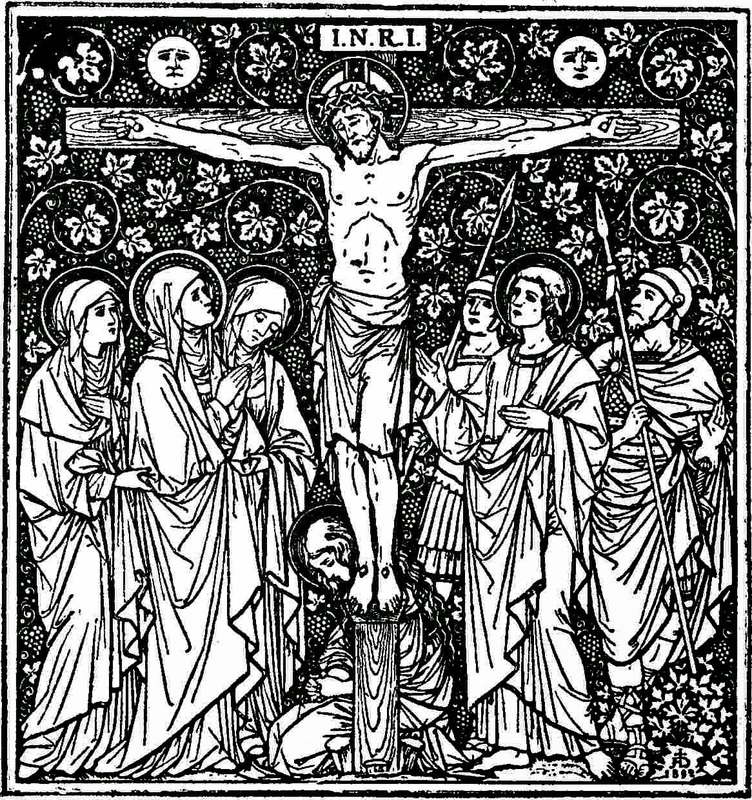 He tells us to do this, and so we do – we have come here this morning to be fed by word and sacrament, to be fed with the Body and Blood of Christ, so that through the re-presentation of the sacrifice of Calvary, we the people of God, can be fed by Him, and fed with Him, so that we can have new life in Him. So let us come to Him, knowing our need of God’s love and mercy, and letting it transform our lives, strengthening our faith and helping us to live out our faith in our lives, so that we can be built up as living stones, as a temple to God’s glory, with our lives proclaiming the saving truth that God loves us, that he forgives our sins, and can heal and restore us, and let us share this saving truth with others, so that they too may enter into the joy of the Lord.